This site is designed to help soldiers, police and related units all around the world, to improve CQB skills, and prevent unnecessary casualties doe to improper tactics. 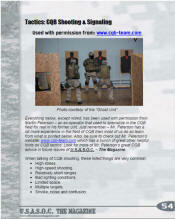 Close Quarter Battle, CQB, Hostage rescue, Room combat. There are many names that cover the art of clearing a building, with possible armed opponents. The techniques described on this site are still in use by special operation forces and elite police like SWAT. 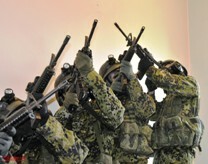 Now it has become necessary for the ordinary soldier to use the same techniques, because of the need to do house searches, with the possibility of meeting armed resistance and non-combatants. This site contains tools to make such tasks easier. It does not contain a "how to do" solution, however it does have information and diagrams that hopefully will ease the task of deciding how to deal with a building clearing problem. Today's battlefield is not in the woods anymore, it has moved to the urban environment. - Tactical videos that will show how to do different entry techniques. - Rappelling entry techniques, entry with ladders. - Tactical forum- Assault on liner targets like buses, trains and airplanes. All info found on this site is a mix of personal experience, guidance from operational units around the world, info found on the internet and of course relevant info sheared by the users of this site. To protect the anonymity of the source, specific terms and details are not described in the text. "To bring better training to those that are in search to become better operators"
"This information detailed in this website is for information purposes only and is published in the good nature to provide a support system to active military, law enforcement and security personnel around the globe. We assume no responsibilities for any misuses or misinterpretation of this information by any person or entity in any way whatsoever. Please use the information at your own discretion."